Colonial Downs is a new track that opened about 6 or 7 years ago in the heart of Virginia, located between Norfolk and Williamsburg Virginia. They run a short 30 day or so thoroughbred meet in the summer and a fall standerbred meet. They have 3 courses. 2 turf (one is 1 mile and 1/4 the 2nd largest turf course next to Belmont) course and a dirt course. I decided to head down there for the weekend of the Virginia Derby and here is what happened. Took a trip to Virginia and went to Colonial Downs Race Track. I arrived in Virginia on a gorgeous day on July 11th one day before the Derby. 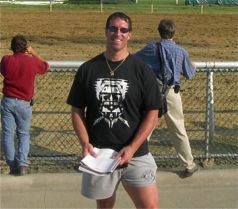 Post time was 5pm so I headed on over to the track about 4:30pm with my girlfriend Melissa for what I hope would be a fun night of racing. The track building itself is small, looks to be 3 or 4 stories high, but inside it is beautiful. Plenty of places to eat and lots of TV's and they even simulcast my favorite track, Great Lake Downs he he. 1st race was a 7 furlong race for 2 year olds. I decided to bet jockey Ryan Fogelsonger on top with the one horse and the 5 horse for 2nd and lo and behold I hit an exacta and I win the first race I am betting. Race #2 is one mile on the turf with a purse of $7,500 and a full field of 13 horses. Decide to play a win bet and use a horse shipping in from West Virginia on top. My horses just wins by a head and holds off a late challenged and I'm 2 for 2 so far. Race 33 was a maiden filly 2 year olds going a mile and a 1/8 on the outer turf course. Decide to play another exacta and I throw a Pimlicio horse in on top with 2 other horses and a Pimlicio jockey, Mario Pino beats me as my horse quit. Race #4 has a small field of 5 horses and the purse is $26,000 allowance race on the dirt at 6 furlongs. I played an exacta and my 3 horse wins easy, but my #4 horses finishes 3rd and I lose ha ha. Race #5 is a mile on the turf with 11 horses. A Philadelphia Park horse is shipping in for this race so naturally I have to box an exacta and I throw Ryan Fogelsonger as my other horse. Ryan wins (he is leading rider here) and holds off a late charging #6 horse and I have 3 winner so far. Also hit an Arlington exacta as I was also playing other tracks here and there. I also watched Mary Doser bring home a 14-1 shot at Great Lake Downs. Race #6 is a 1 mile and 1/8 on the inner turf for a purse of $16,000. I played Ryan again just to win and his horse ran out of gas and 2 huge long shots came in and the exacta played $697.20!! Wish I even had half of that ha ha. Race #7 is the last turf race of the night and I played Ryan and Mario Pino in an exacta box and Mario sets the pace and wins, but Ryan doesn't get 2nd and I lose. Race #8 was a $17,000 purse going one mile on the dirt. This was a very tough race to figure out and Ryan won again, this time on a 15-1 shot and I got 2nd ha ha. The finale is next and after the 8th race I got a pic with jockey Remi Gunn which was cool. Race #9 a maiden claiming race going 1 mile for a purse of $6,000. I played a $4 exacta box 4-6 in the finale. A 20-1 morning line bomb with bug rider Eric Rodriguez a board wins and wins easy and went off at 11-1. Well tomorrow it's Derby time. Metal hanging at the track. Check out the horses and jockeys going by in the background. This place was packed with people and it was a gorgeous warm summer day down here in Virginia. Got to the track just in time to see a nice ride by Eric Rodriguez on the turf at one mile. I just walked in the door as they were loading in the gate so I had no chance at a bet. Race #2 is a starter allowance 5 furlongs on the turf. Decide to use red hot Ryan again and I throw $5 to win on him at 4-1 odds. The 6 horse just holds on as Ryan loses by a mere nose. Race #3 is a 2 1/4 mile stakes steeple chase race. Never seen one of these live, but it looks kinda cool and different. I have only heard of jockey Gus Brown and not any of the others. Decide to use #1 horse and he comes off the pace and just gets up for me and survives an objection and I am a winner at 3-1 odds. Race #4 is another 5 furlong starter allowance race. I play a $2 exacta with 6 horse on top with the 2 and 8 and Ryan's horse jump out of the gate like a bat out of hell and win's easy and I'm no winner ha ha. Race #5 is another steeple chase stakes race. I play with #3 horse and a 22-1 shot goes on to win and I lose yet again ha ha. These steeple chase races are kinda dangerous as the horses have to jump over stuff and a jockey can easily get hurt. Bythe Miller recently retired due to getting a concussion and she was a steeple chase rider. After the race got a picture with jockey Danielle Hodson which was cool. Race #6 is a one mile and 1/8 optional claiming with a purse of $28,000. Decide to play the #3 horse and throw $5 to win on him at 5-1 odds and jockey Jeremy Rose is down to ride some of the stake races and sure enough his horse blows past mine in the stretch to beat me. Race #7 is 5 1/2 furlongs on the turf. Played Ryan again and sure enough he won for me. Race #8 is $17,000 claiming at 5 1/2 on the turf. Overheard some trainers talking about Mario Pino and I throw $5 to win on him and sure enough he wins ha ha. And I also have the exacta for $28.00. Thank you trainers he he. Race #9 is a $200,000 stakes race going 1 mile and 1/8 on the turf with a field of 9. I throw Edgar Prado on top as he is down here to ride with 2 other horses, both which are long shots. Edgar's horse is 3-5 and breaks through the gate and the outrider gets him and they start the race and this horse shows heart as he just holds on to win and I hit the exacta. Race #10 is the big $500,000 Virginia Derby. Bob Baffett is in attendance as he has a horse that goes off at 1-5. Edgar Prado wins the race as Pat Day (on Baffett's horse) is nowhere to be found and Prado goes wire to wire and we got some huge show prices. The #6 horse paid $21.60 to place and $54.20 to show! Stayed for one more race and Phila Park trainer Clifford Sise shipped down a horse and I bet him and the horse made a move, but didn't fire in the stretch and I lost $5 ha ha. Had a great time at this track and if your ever near here make sure you stop by and check it out. Me and jockey Remi Gunn. See ya at the races and in the winner’s circle.